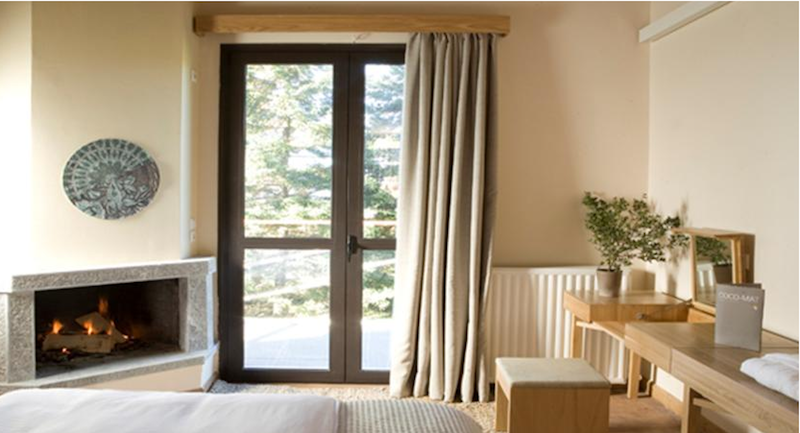 Double room only 135€ for two nights staying.This offer is valid until March 31rd 2015. Superbly rammed in the rich forest of Menalon in Arcadia, the Natura Hotel Vytina offers an enjoyable and relaxing sojourn. Runs as a family business and is characterized by its friendly and relaxing environment. All of its twelve private guestrooms are fully equipped with excellent view and home like feeling. 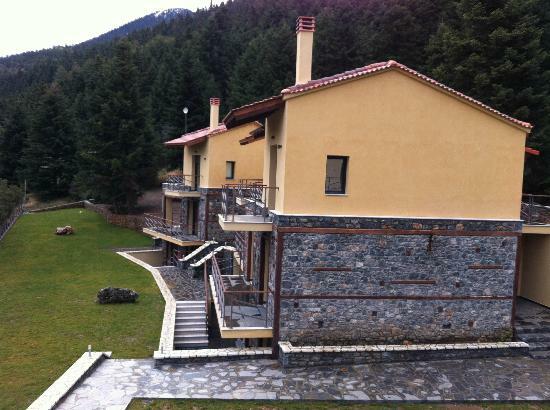 Resides on the most beautiful side of Mainalon mountain, it is in only 3 minutes away from the center of Vytina village. Each room at the Natura Hotel Vytina is uniquely designed with its own character and personality. We cater to all types of guests from singles, students, couples and families. 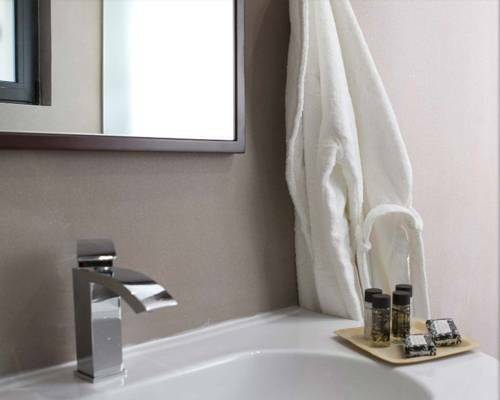 We offer 12 individually temperature controlled guestrooms in a variety of sizes. Our single, double and superior double/triple rooms vary from 12 to 20 meters square and two of them also have a fireplace. Recently refurbished tapestries and furnishings give off a distinct look and feel to every room. Two of our rooms are connected, which is very comfortable for big families or families with teenagers. Free Internet: WiFi is available in all areas and is free of charge. Free Parking: Free public parking is possible on site (reservation is not needed). 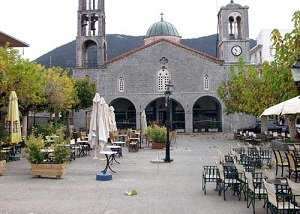 The major attraction in Vytina village is the Holy Church of Saint Tryphon which dominates the square of the village, built in 1846 and having as a main construction material the black marble which has been extracted from the surrounding area. In addition, the two traditional ovens that reside next to central square and the Folklore Museum complete the main symbols of the village. The entrance road with the magnificent site of trees in both sides, gives a warm welcome to the visitors. Excellent native foods and drinks can be purchased at the village shops. 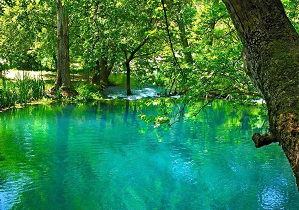 Loussios River, has a length of twenty three (23) kilometers from the stems of Karkalou plateau flowing up to Karitaina village. According to the tradition, this is the place where Zeus “bathed” by the nymphs, when he was born. Its waters temperature is maintain constant all year round. This place is ideal for water sports such as rafting and canoe kayak, but also for trekking and mountain bike. You can enjoy these sports especially in the area of Ancient Gortyn near the bridge of Atsicholou. 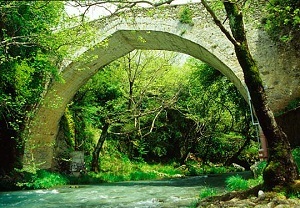 Menalon Mountain is a source of life and happiness throughout the Peloponnese. Stretching proudly from the plateau of Tripoli by Lucius Gorge and Lake Ladonas to Megalopolis. The ski resort is located in Ostrakina plateau at an altitude of 1600 meters and reaches the highest peak of Mainalon, Prophet Elias at 1981 meters. It belongs to the EOS Tripoli and it is 12 km away from Vytina village. The artificial Lake of Ladonas is located between the mountains of Langadino and Afrodisio, where it flows like a snake shape. Initially it was a river but in 1955 it has been reformed to a lake due to the construction of the hydroelectric dam. Rafting, Paintball, Canoe kayak, Mountain bike, flying fox & Monkey Bridge are just a sample of the available activities in the area. Ladonas lake is 53 km long, while Ladonas river (the place where the activities take place) is 43 km long. 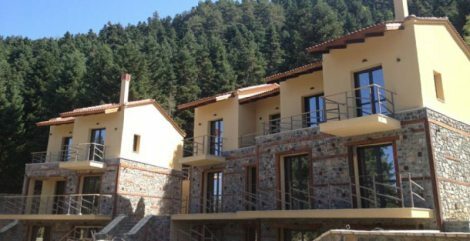 In 20 km away of Vytina village, in a quiet place in the heart of Menalon, the village of Greece, the village of Theodoros Kolokotronis is located, the wonderful Libovisi. 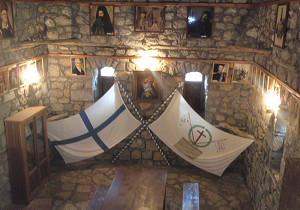 It is the village that nurtured the free and unconquered generation of Kolokotronis. 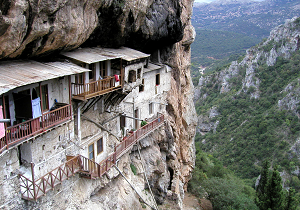 It is the born village of liberator of the genus, Theodoros Kolokotronis. Today it is uninhabited. But the historic church of St. John and the refurbished home of Kolokotronis reveal its existence, thanks to the donation of P. Angelopoulos. The wildlife along the route is fantastic. Throughout the road is covered with firs and it really fascinates the visitor. Perhaps the best road route in Greece! Our visitors are very satisfied with our services and the family-like atmosphere. You may read below a small sample from our visitor’s book. It was a very pleasant surprise. The price offer we had was very good and did not expect much. But everything was very close to perfection. Rooms very spacious and nicely decorated. The cocomat bed and pillow guarantee a very good sleep. Was snowing, and the place is surrounded by the forest so the view was amazing. We were very happy, will definitely go again. Kostas H., Stayed March 2013, traveled as a couple. We were four couples with children visiting the hotel. 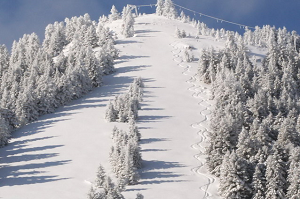 It was at 12 km from the Mainalon ski resort and at the same time very close to Vytina village and the central highway for Athens. The family running it were all very helpful and willing to help us spend a nice time. The rooms were great, the common premises also. Definitely worth a visit again. Chris K., Stayed February 2013, traveled with family. It was a nice and pleasant stay, at a very beautiful place in Arcadia. Minimal decoration, kind stuff, helping us every moment we need any info. The accommodation was excellent and the best part was the 4-layer bed which offered a perfect sleep. The breakfast buffet is influenced from Mediterranean diet, with great quality food. I definitely go again. Giorgos S., Stayed January 2014, traveled as a couple. We stayed there for a relaxing weekend! The staff was very nice and the breakfast was perfect. The hotel is ran by a really nice family. They even drove us to the town of Vytina. Our room was perfect and had a fire place. Not to forget to mention the cocomat mattress in which I had one of the best sleeps ever in a hotel. I would definitely recommend it! Chris S., Stayed September 2014, traveled as a couple. My wife and I stayed at this hotel for two nights on August 16 and 17 2013. We found it very relaxing with great views of Vytina on the side of mountain Mainalon surrounded by trees. The hotel is situated at a height of 1300 meters above the sea level, near to the town of Vytina. The accommodations were very good and the morning breakfast was excellent, they were taking orders for egg omelettes threat were delicious. My wife and I recommend this hotel for a stay for people that enjoy nature and the outdoors. Harry C., Stayed August 2013, traveled as a couple.